There are currently 101 people online. Intel shared details about the future of Quark, the company's line of ultra-small SoCs for compact devices with low power consumption such as wearable electronics. Next year the chip giant will introduce "Liffy Island" and in 2016 you can expect "Seal Beach". Like the current Quark X1000 SoC, Liffy Island is a 32-bit single-core x86 processor with Hyper-Threading support. Liffy Island will boost the frequency from 400MHz to 533MHz and will quadruple the L1 cache memory to 64KB. Other than that, memory support is upgraded from DDR3-800 to DDR3L-1066 and embedded SRAM is doubled to 1MB. Depending on the model, the power consumption of these SoCs will range from 1.2W to 2W. 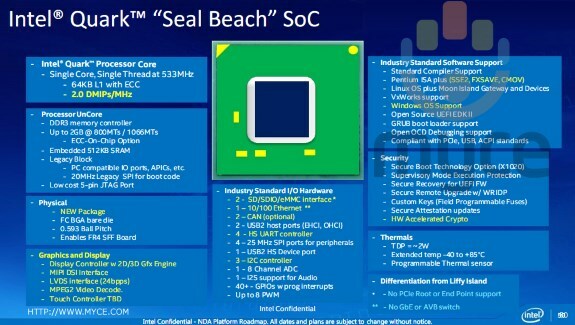 The launch of Seal Beach in 2016 promises big gains in performance, this chip will have an integrated graphics core with 3D graphics support and MPEG2 decoding and the processor part will receive the SSE2 instruction set and support for hardware accelerated encryption. Seal Beach will be capable of running Windows. More slides at MyCE.